THE GREAT TEA REVOLUTION !!! Many thanks for all responses from Sebastian Pole, co-founder and master herbsmith of Pukka Herbs. 1) When you started the company, the world had so few luxurious tea brands; why did you believe (correctly) that there was a gap in the market, and indeed a market in the gap? Myself and Tim Westwell (co-founder) were brought together in 2002 by a mutual interest in promoting wellbeing. I was already a qualified practitioner in Ayurvedic and Chinese and Western herbal medicine, while Tim was looking to turn an idea into an ethically-conscious business. As an avid herb grower, I was already a huge fan of herbal teas, but fed up of the weak, dusty flavourings. We realised that there was a gap in the market for innovative teas that tasted delicious and showcased the true brilliance of herbs. 2) How did you settle upon the ‘Pukka’ brand-name, and is it ever confused with a Jamie Oliver diffusion line? I’m not sure we have ever been confused with Jamie Oliver, but maybe once or twice with a certain pie company! We gave the name a huge amount of consideration, but when we hit on ‘Pukka’, it just seemed to fit perfectly. In Hindi ‘pukka’ means ‘real, authentic or genuine’ which is at the very heart of what we do. Colloquially people associate the term with ‘ripe, juicy, tasty and delicious’ – exactly how we would describe our teas. 3) What are the core values and principles behind the Pukka Herbs nutritional ethos, and how do you demonstrate that within your company’s culture? The organic movement is at the heart of absolutely everything we do. Organic stands for sustainability – you put back in what you take out, you regenerate the soil that feeds your family and you try to improve what you have been given. We want farming practices that build soil fertility and, in turn, produce nutritious foods, rather than manipulate produce into ‘Franken-foods’. We want everyone that Pukka touches to feel its benefit: from the growers, suppliers, manufacturers and staff, all the way through to the customers. 4) Were your personal cultural influences (which may or may not feed into the Pukka brand) based upon any particular experiences outside of the UK; Eastern, Arabian, Indian, Oriental, Tribal etc.? After my degree in Hindi and Religious Studies, I spent my twenties wandering around India, learning yoga, sleeping under the stars and walking for weeks in the Himalayas. I became fascinated with the ancient Indian philosophy of Ayurveda so I returned to college to study Ayurvedic, Chinese and Western herbal medicine. I fell head-over-heels in love with the person-centred poetry of traditional medicine that had such deep insights into the workings of nature. To this day, living an Ayurvedic lifestyle has a monumental influence in everything I do, both professionally and personally. 5) What do you see as the key health benefits of drinking herbal tea? We have co-evolved with plants and just as they develop natural compounds to protect themselves from the ravages of their environment, so can we. When we drink a cup of tea we sip the essence of nature and imbibe these colourful, tasty and aromatic molecules that offer us protection from stress, tiredness and invasion. We used to eat over 200 different types of plants and now we get most of our diet from 20. Drinking herbal teas, that are blended into balanced formulas and made from the highest grade herbs, allows us to bathe in a broader repertoire of plant protection. 6) Are there times you just want a cup of plain and simple English breakfast, and feel bamboozled by the sheer choice of flavours available to consumers? Sometimes you might just want a plain and simple cuppa – that’s why we do an English Breakfast tea too! 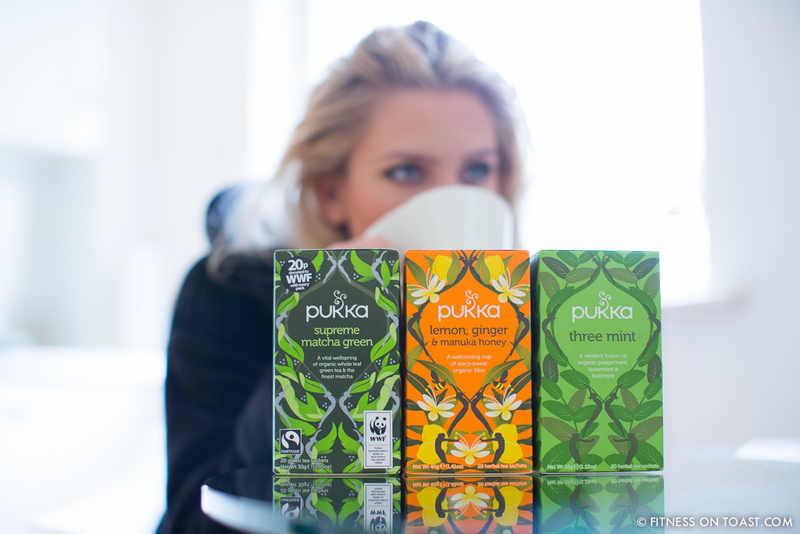 The difference with Pukka tea is the quality of herbs we use; in this instance whole-leaf organic and fairtrade tea. We also use sachets to protect the high essential oil content of our organic herbs to bring you the fullest flavour. We offer a wide variety of teas to cater for different tastes and moods, and we’re constantly developing new flavours too, so the mood for a simple cuppa is often satisfied by the joy of a great herbal tea. 7) Various foods periodically grow into their ‘zeitgeist’ of being ‘superfoods’; matcha green tea seems to be blossoming into exactly that right now! What’s your take on the benefits of matcha, and for that matter, green tea as a whole? Green tea sales are the fastest growing in the tea sector, increasing by 20% in 2013, and with good reason; it is a powerful rejuvenative, improving a wide spectrum of health. In recent years, Matcha in particular has been recognised as a superfood and marrying it with tea means everyday consumption is more convenient than ever. Matcha green tea is full of super antioxidant qualities that are ultra-energising and brilliant at neutralising free radicals. A balance between free radicals and antioxidants is necessary for proper physiological function. We’ve recently just launched a new range of green teas, including Supreme Matcha Green, plus Clean Green, Serene Jasmine Green and Cool Mint Green. 8) Mint or chamomile before bed? Definitely Chamomile. It’s rich in relaxing and essential oils that help to balance and calm your mind, body and spirit. Mint on the other hand will awaken your mind, so is best when you need an extra boost in the day. 9) Any weird and wonderful herbal teas you’d specifically call out as a good ‘pre-workout’ boost? Before you hit the trail or exercise getting plenty of fluids is essential. And if you make these fluids packed with strengthening and rejuvenating herbs, all the better. Our Revitalise tea is an ascendant blend of cinnamon and elderflower bringing vitality and stamina. Our Vitalise superfood powder is made with 30 of nature’s most powerful botanicals and gives you a serving of B and C Vitamins to boost your energy. 10) Is there a herbal tea war going on? TeaPigs seem a close overlap, with Twinings and Clipper all fighting hard to get us consumers thirsty for more ‘infusions’. How do you win out, and what’s the key differentiator of Pukka over the others? I like to think we operate in a different space to other tea brands. Everything we do revolves around an overarching aim to discover delicious and effective ways to harness nature’s power in our teas and also our food supplements, Pukka Organic Wellbeing, so they are as potent and flavourful as possible. Of course, everything we create is steeped in the wisdom of the herbal tradition and this brings a deeply inspiring connection with nature and the power of plants. This brings joy, vitality and wonder, three experiences that add great value to our life. Also, our commitment to organic, trading fairly and using pharmacopoeial grade herbs are embedded in our Pukka-soul, helping to make the world of Pukka that little bit more deliciously colourful. What a great interview, thank you for taking the time to put it together. Perfect timing too, with Winter coming be nice to have something healthy and tasty to drink. I’ll have to check to see if Pukka is available in my local grocery store. what a wonderful interview – you brought healthy thoughts – well done! What a lovely interview! I love Pukka teas- they’re so tasty they quite often feel like a treat and are perfect when i have a sugar craving- much better than reaching for hobnobs! Great point Jess – I find that the mint & liquorice (each to their own) is an epic mid-afternoon filler, and obviously keeps the hydration up too! I nominated you for an award for up and coming bloggers called the One Lovely Blog award! Check out my latest post for details and if you wish to not partake in this I take no offense. Just want to share how special your blog is to me. I know you’re more established but I still wanted to recognize your work! Thanks so much for the lovely nomination – I really appreciate hearing that you like my recipe posts! No amount of ‘establishment’ will take the smile off my face 😀 !! You’re very welcome!! Your posts inspire me so I felt like others needed to hear about it too!! I think herbal tea can be a great help when dieting. I always find green tea gives you that extra boost you need, whilst still being great for your body, unlike the commonly bought high in sugar energy drinks in the market . Where do I buy a pukka tea cup? A great interview with lot of information and advises for a healthy live. I use camomile every day before bed and mint for extra energy and to relieve headaches. Green tea can help to lose weight, especially when it combines the other antioxidants.